I’d argue that under Trump, the national security establishment not only hasn’t missed a beat but indeed has gained dangerous strength. Now it is ever more autonomous and practically impervious to criticism. AMY GOODMAN: So, you talked about the people who populate the networks as pundits, and you’ve been a fierce critic of the national security state, or at least understanding who it is who is explaining things to us. Reading from Politico, “Former CIA Director John Brennan … the latest superspook,” they said, “to be reborn as a TV newsie. He just cashed in at NBC News as a ‘senior national security and intelligence analyst’ and served his first expert views … on Meet the Press. The Brennan acquisition seeks to elevate NBC to spook parity with CNN, which employs former Director of National Intelligence James Clapper and former CIADirector Michael Hayden in a similar capacity. And it goes on and on and on. These are now the pundits. And so, when you have a situation like President Trump announcing he will immediately withdraw U.S. troops from Syria and halve the troops that are in Afghanistan, you have this massive attack on him that’s actually led by the permanent national security state under the guise of pundits on television. At this point Arkin is selling the idea, with which I agree, that the security state has become so powerful that it’s able to use the news networks, who compete for “spook parity,” as their sales platforms. But in doing so, he’s making another point as well, if not mindfully — that the national security state is approaching (or has approached) the status of a latter-day Praetorian Guard, a military organization without whose approval no one can become or remain president. And I think that probably because of the phenomenon of Donald Trump—let’s just be honest about it—really what we see on TV now is former Obama administration officials masquerading as analysts who are nonpartisan, when in fact they are partisan. Brennan, Clapper (he who lied to Congress but, as an approved insider, was forgiven), and a number of other “former Obama administration officials” are not just partisan, pro-endless war advocates “masquerading as analysts”; they are “analysts” working to delegitimize Donald Trump. Whether not Trump is a legitimate president, that “partisan superspooks” are uncritically accepted as part of the takedown operation should be concerning. Arkin seems to recognize this. Later in the interview he’s asked to explain his comment about the FBI, which I noted above. WILLIAM ARKIN: Well, there’s a crazy collateral damage of Donald Trump. And that is that there are a lot of liberals in America who believe that the CIA and the FBI is going to somehow save the country from Donald Trump. Well, I’m sorry, I’m not a particular fan of either the CIA or the FBI. And the FBI, in particular, has a deplorable record in American society, from Martin Luther King and the peace movements of the 1960s all the way up through Wen Ho Lee and others who have been persecuted by the FBI. And there’s no real evidence that the FBI is either—is that competent of an institution, to begin with, in terms of even pursuing the prosecutions that it’s pursuing. But yet we lionize them. We hold them up on a pedestal, that somehow they are the truth tellers, that they’re the ones who are getting to the bottom of things, when there’s just no evidence that that’s the case. AMY GOODMAN: And what do you mean by the “creeping fascism of homeland security”? WILLIAM ARKIN: You know, I was against the creation of the Homeland Security Department in 2003, to begin with. First of all, don’t like the word. “Homeland security” sounds a little bit brown-shirty to me. But, second of all, it was created to be a counterterrorist organization, a domestic counterterrorist organization. And all during the Obama administration, we heard Janet Napolitano, the secretary of homeland security, saying, “You know, we are counterterrorism.” But since then, we’ve seen they’re creeping into cybersecurity. We’ve seen them creeping into election security. We’ve seen ICE and TSA become the second and third largest federal law enforcement agencies in the country. And so, now homeland security sort of has become a domestic intelligence agency with really an unclear remit, really with broad powers that we don’t fully understand. And we tend, again, to say “Donald Trump’s Homeland Security Department.” Donald Trump couldn’t find the Department of Homeland Security if somebody set him on the streets of New York—of Washington, D.C. So it’s not Donald Trump’s Homeland Security Department. It’s our Homeland Security Department. And I think it’s important for us to recognize that this is a department that is really operating on its own behalf and out of control. …if a President Sanders attempted to do all that, what would be the response of the national security apparatus, guardians of the status quo? Whom would they serve, the billionaire owners of the established, corrupt-but-lucrative bipartisan state, or the Sanders-led revolutionary FDR-style government they’re constitutionally sworn to defend? As a reminder: The Praetorian Guard was an elite unit of the Imperial Roman army whose members served as personal bodyguards to the Roman emperors. … [T]he Guard became notable for its intrigue and interference in Roman politics, to the point of overthrowing emperors and proclaiming their successors. In 312, the Guard was disbanded by Constantine the Great [after defeating them and their latest declared emperor at the Battle of the Milvian Bridge]. The Guard murdered Caligula — insane, incompetent and dangerous — and declared Claudius emperor, the first of its many “interferences.” After Claudius was poisoned, they transferred allegiance to Nero. It went like this for centuries (of which we have none, by the way). 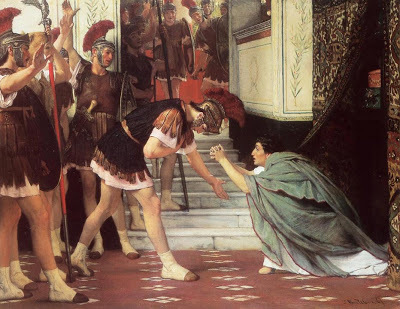 The Guard had the power to “make or break emperors.” Are we growing our own Praetorian Guard, or giving them leave to grow, under cover of their anti-Trump “resistance”? If I were one of the national security superspooks, I’d want nothing better than to be welcomed — and washed clean — by acceptance into that well-praised effort. Doors would open publicly that before were open only in secret. In that sense, Trump may be even more dangerous than he’s now considered to be. What he may do while still with us may be frightful to consider. But the form of government he leaves behind may be worse, especially if he cements in the public mind the rightness of superspooks acting as new-minted kingmakers. Sanders supporters, take note. We’re skating on dangerous ground here. Oh, and BTW, Talbot’s book was not reviewed by the MSM. He had to do his own promotion tour. I find it far more curious that nobody has even made a serious attempt at assassinating Trump. Trump dwarfs reckless and irresponsible actions taken by Kennedy or Reagan yet the forces speculatively attributed to Kennedy’s offing have not as much as tossed a soccer ball at Trump. That factoid alone seems to undermine arguments that the Deep Security State or whichever boogyman conspiracy theorists dredge up remain fictions of an idle mind or fictions invented to make sense out of nonsense. On the other hand, Arkin’s allusions to fascism are reasonable and have substantial historical precedent as a pattern fascists deploy in their attempts to overturn democracy – ostensibly to save it from the very chaos that they created. Fascists do not need assassinations when they can simply redefine events via the media as lawlessness, chaos, and Armageddon on the march. TV news loves “film at 11,” and we see such propaganda being spun byTrump hourly. It is noteworthy that the Heimatschutz Deep State sits silently. This might be because, as historians have pointed out, they are in bed with the devil they despise. They are profiting personally, and arrogantly think that they can put their Gini back in the bottle when the time comes just as past conservative capitalists discovered is not so easy with Josef, Adolf, and Benito. Trump has no timeline for withdrawal from Syria. JFK’s Vietnam withdrawal memo specifies 1000 troops a month and he was doing it. Yes, I was going to say. I agree with Arkin, but, haven’t we already had a Praetorian guard since November 22, 1963? MLK wasn’t even a politician just a highly influential person. The Devil’s Chessboard and JFK And The Unspeakable should be required reading. Called it, December 13, 2016. Very politely, but I called it. Read all the way to the end. yep, you did. Blast from the past. It’s interesting to observe, from the US media broadcast into the UK and guest appearances on UK airwaves, the hacks who often legitimise and glorify the praetorian guard interference and how they do so. Eugene Robinson and cry babies Jonathan Capehart and Don Lemon often talk about “adults in the room” and “thank (God, Robinson) for the deep state”. When US hacks are invited by UK broadcasters, the UK hosts nod in perfect agreement. It’s as if this tactic is what will be used against any government that may emerge to reverse neoliberalism and its imperial manifestation in the UK. One can imagine, as per recent outbursts by Richard Ferry and Benjamin Griveaux, that the same will be used in France. As per Yves’ caution, it’s not just Sanders supporters who should take note. That may explain why the French revolution employed devices like guillotines to ensure an efficient and humane handover of power. The alternative tends to be no change at all. I dont get it. I thought the idea of democracy was that it allowed social pressure to be released by evolutionary change, not revolutionary. Gaming the system in this way may cause “blowback”. I get the impression that the current PTB have forgotten these lessons. No. It’s why they militarize the police everywhere. When enough people turn against them even militarized police won’t matter. In fact, violence against dissent virtually guarantees a violent end to rulers. control primarily through these screens. Said citizenry might have other ideas about that, and, annoyingly, often start thinking for themselves when rhetoric and reality diverge too much.. I think that the files coming from the Integrity Initiative shown how it is done. It would be naive to think that there was not a similar effort on the other side of the Atlantic and not just about the Russians either. The vehemence of the fight against Trump is very revealing. Truth be told, it was Clinton that was scheduled to be the winner in 2016 and when that did not happen, too many agencies proceeded to collectively lose their s***. The wholesale support of the media against Trump is not to wondered at either as they are part of the establishment themselves. Just ask the French about that point. Said before that if you had had a Sanders Presidency that the same would have happened with him and that he would have been sandbagged in while fending off attacks on his wife. Government organizations are too vested in the politics now to do anything else. The fact that they were coordinating with the Clinton campaign and, after 2016, decided off their own bat to instigate a treason investigation on a sitting President shows how far off the reservation they are. If anyone, it is agents of the FBI that could be charged with treason. One of the things that keeps this going is a subliminal fantasy about how Trump’s Presidency comes to an end. I can see it now. The Attorney General, Edmund Randolph, with the Speakers of the Senate and the House – Mitch McConnell, Chuck Schumer and Nancy Pelosi acting as witnesses – go to Trump in the White House and tell him that time’s up. With a nod by the AG, Trump’s own Secret Service detail step forward and arrest him and place him in handcuffs. The Attorney general reads him his Miranda warning and Trump is taken directly to the White House lawn in the full glare of the gleeful media where he is loaded aboard the Marine One – the Presidential helicopter. From here he is taken to a Federal Court where he is processed on charges of treason whereupon he is taken directly to Fort Leavenworth Federal Penitentiary. And if you believe this fantasy scenario ever happening, I can get you a good price on the Sydney Harbour Bridge. Wont happen, impeachment and conviction is becoming more a reality. There are already crazed liberals that think Bernie and his supporters were at best unwitting dupes who were part of a Russian plot to discredit Clinton. You see, nobody ever criticized the most qualified candidate in history before 2016. And I’ve seen a few who call Bernie a Russian agent. Many liberals obviously enjoy playing the role of superpatriot. So they will be wildly enthusiastic about an FBI primary. I don’t understand the fear of Russia. At best, they’re a shadow of their former selves. They have been weakening as a nation from a demographic perspective for the past few decades. The population of France and Germany combined equals that of Russia at this point in history. Their military tech is aged out. They have the corner on some energy sources, like gas, but so does China. The entire thing is so stupid and backward facing that it boggles the mind. This isn’t the Soviet Union. There’s no competition of ideas vis a vis capitalism vs communism. So what gives? Indeed. “Homeland” is of course a show starring Claire Danes. It’s the Great Game i.e. geopolitics. The West wants to exploit Russia and have it in its knees again like the former Yugoslavia. We’ve always been at war with Eurasia. One is the age of elite policy makers, not necessarily the President or Speaker, but the people in the cadre who control what their daily memo says. They were young adults in the 80’s. The USSR was still the serious enemy, and now they get to prove it. I don’t doubt there are bruised egos about Putin kicking the 90’s “do gooders” who taught Russia how to be capitalist out. Simple revenge at having seen wealth extraction models disappear for Westerners is at play. The other side is the need for an official enemy to continue to justify military spending at hideous post-9/11 rates or even 1991 rates. One, Russia isn’t Canada. Most people will never go there, so its effectively foreign and hidden behind decades of propaganda from the Cold War as heavy handed as those military parades in Red Square or as innocuous as Yakov Smirnoff. “Do we really need a million dollar missile to blow up a wedding?” There is a healthy skepticism of the MIC. Despite the actions of our current and previous President, its fair to say they both promised to cut down on wasteful “defense” spending and turn it to domestic concerns (Trump’s case the wall, but its still the same.). China would be too obvious at the same time, and with the war on Muslims running out of steam, switching over to a war on “yellow devils” would be a bit on the nose. Goering’s point about a Russian farmer and a German farmer having no natural conflict is still relevant. I won’t take a romantic notion of China, but the Tibet invasion was in the 50’s and lets be honest we would have done the same. Enter Russia. It still has a place in pop culture, is very large on the map, and still has plenty of nukes. If there were no enemies, why are we in Afghanistan? In Iraq? All those bases in Africa? Terrorists? Michael Moore in “Canadian Bacon” didn’t predict 9/11, but he did point out after a time international terrorism would not be deemed as a threat worthy of MIC largesse. The Boston Marathon Bombers weren’t caught by the manhunt which ran out of steam because they had no way of feeding the officers if stores weren’t open, but they were sighted by an alert private citizen. This narrative may not reach the mass audience quickly but it changes people once they realize this versus the narrative of “the CIA can’t tell you about its successes because they are secret. Now watch Argo which was really about Canadian intelligence services” is fraudulent. Communism was always just a red herring. That is why Saker has a blog. He was anti-USSR, until he figured out that anti-communism was just a ruse. It is – and has been for a long time – all about anti-Russia. Why? You have to ask the British elite – they’ve been Russo-phobic for centuries. Again, why? My personal pet theory is that they are just p-d off that they never could conquer Russia – and think of all that wealth buried over there. What a good, greedy capitalist could make of it! Unfortunately, since at least 1056, Russia has charted a separate path from the west and refused to be subdued. If you remember the big Zbigniew B. – he clearly stated what the Brits have been feeling for a long time – the combination of Russia and Germany could rule the world – if so inclined (at least that is what the perfidious Albion always worried about). Wars have been fought over the topic. Plus, your description of the current Russia is waaayyy off – in fact, it is a modern country, with a fierce and disciplined military and weapons that far exceed anything the US has. Even the US military types have admitted/accepted that much. So revisions are needed… But yes, it is stupid and futile. The russian federation’s military capacity is more than a few notches below u.s. or combines n.a.t.o capacity.with the loss of the ukraine the soviet/russian manufacturing capacity took a pretty big hit and they’re still trying to adjusr.i’d agree that they’re no small time joke. I suggest you educate yourself re Russian military capability which has evolved and improved a great deal over the last 10-15 years. 1. This is the military that has come close to restoring, in about 3 plus years, the fortunes of the Assad govt in Syria and was the key element in defeating the combined jihadi forces backed by NATO and the Gulf kingdoms – you know, the ones with hundreds of millions if not billions in weapons and other materiel aid. (Unlike that great US NATO military machine that has been stuck in Afghanistan for now over 17 years fighting a Taliban which doesn’t receive anything like those 100s of millions in aid.). 2. The oh-so peerless Israeli Air Force is now forced to hide behind Lebanese civil air traffic to launch nuisance attacks into Syria ever since Russia deployed its S-300 AD system over there. It also appears that older post Soviet vintage AD weapons are proving quite effective against the US and Western weaponry being launched against Syria. What were the figures from the last cruise missile attack launched by US-NATO against Syria in 2018 – something like 100 missiles launched and almost 80% intercepted? 3. Russia has at least a one decade lead over the US in the production of hypersonic weapons and their deployment. The end of the Carrier Battle Group (CBG) is now baked into the future for good. The US can use these dinosaurs to intimidate countries like Somalia and Venezuela but you’ll never see them sailing into full fledged combat against Russia (or China). 4. Russian submarine fleet is fully competitive with anything in the NATO arsenal and may soon receive advanced weaponry that will grant it additional technical advantages. Of course, it’s possible that the US and NATO navy crews might be too busy trying to avoid collisions with tankers or container ships than to actually worry about confronting the Russian navy. 5. Russian electronic warfare (EW) capability is quite robust and it’s an open question as to whether many of the high tech systems used by the US and NATO would work in the event of an actual military conflict with Russia. Of course, US and NATO have their own EW and counter EW capability too. Russian military doctrine is based upon defence of the home nation and it’s immediate neighbourhood. They’re not looking to be the “world’s policeman”. The Russian military industrial complex is subject to the needs and requirements of this doctrine as opposed to the “market” driven crony capitalist MIC in the US where lining shareholder and executive pockets is the name of the game. This is why Russia gets so much more bang for it’s defence buck ($50+ billion versus $700+ billion for the US). I could go on and on but it’s clear that too many people in the West (especially in the media and political class) are living in a fictional Tom Clancy Top Gun type fantasy. Real war with a peer competitor like Russia, China (or even a regional power like Iran) is going to be an eye opening experience! I concur with Arkin’s views of Homeland Security. To use his term, I thought it “brown-shirty” at the outset and it has grown ever more so. Too much of the flavor of the secret police about it. Was 9/11 just the excuse, the occasion, for the long planned creation of a domestic surveillance agency or is that being too paranoid? Is Trump the perfect “useful idiot” giving cover for the fascists… we have always had our fascists but the dangerous ones dress well and speak softly … to advance their ideas? I guess it was no accident that Steve Bannon made reference to Julius Evola. Well, our Rulers had the so-called Patriot Act ready to go, so maybe not “too paranoid”. In the post, the term “[national] security state” occurs several times. In the comments, the term “deep state” is being used. Are those terms to be properly understood as synonyms? Meanwhile, does “security state” differ in meaning from “national security state,” or is the former merely shorthand for the latter? And we tend, again, to say “Donald Trump’s Homeland Security Department.” Donald Trump couldn’t find the Department of Homeland Security if somebody set him on the streets of New York—of Washington, D.C. So it’s not Donald Trump’s Homeland Security Department. It’s our Homeland Security Department. This!! Thanks for another excellent post. I have to add that both Down With Tyranny and Democracy Now have also contributed to disinformation that has aided our Praetorians, in my opinion. But this is good, and I’m glad someone with Arkin’s status is helping shed some light on our sad situation. Well let’s have the details PJ so DWT and DN may be informed of your doubts and the matter hopefully quickly settled. It would be unrealistic to expect these principled journalists to get it completely right every time. I hate to see dissension in the ranks of those of us who seek for change. Just saw your comment. Sorry. My concerns weren’t about principled journalists missing a few facts. Rather, it was about their reproducing mainstream narratives that justify the actions of our Praetorian security complex. For example, DWT has published a lot of good material (as demonstrated above). But it has also posted what *in my opinion* is some absolutely ridiculous Russiagate crap. They have a number of contributors, and this seems to vary according to who is posting. They also contributed to the smear campaign against Tulsi Gabbard (which I see as contributing to empire defense, though not everyone will agree). The Russia stuff seems to be mainly Trump hatred, but it contributes to the mainstream narrative nonetheless. Again, this is only some contributors; others are very good. So we could say it is an individual problem — but DWT provides the forum. A lot of lefties have viewed DN as a “left-gatekeeper”: good on a number of issues but obfuscating on others of particular importance to the blob. For example, I was especially irritated by its coverage of Russia and Syria. While *Tucker Carlson* was dismantling the official narrative on Syrian gas attacks, the “progressive” DN was providing fora for Assad demonizers and proponents of the “moderate rebel” myth — at suspiciously crucial times during that campaign. For “progressives” who believe in the Russian collusion story or the idea that our intervention in Syria (or anywhere) has something to do with protecting innocent citizens or promoting “democracy,” I guess this is no problem. Unfortunately, it is a real problem for me if you are going to call yourself a progressive alternative source that differs from the NY Times. Ok, having gotten that off my chest, I will say that both sites put out good stuff as well (again, witness the article above). So when they do, I am happy to acknowledge it. Just got back and saw your reply. Many thanks. Arkin’s version of the Praetorian Guard is somewhat at odds with the disarray seen routinely. Note all those FBI firings and public humiliations over the past few years. More sunlight is needed to disinfect the questionable Bureau processes, and those of their fellow travelers at the DOJ. That could help restore some semblance of the republic to which many people routinely pledge their allegiance through the flag salute. The FBI loves Trump. The CIA loves Trump. Democratic fundraisers love Trump. Best thing that could have happened to any of them (from their perspective, of course, not my own). While noticing the way the news media preps the country for spook exaltation, the “entertainment” arm of the empire preps through the myriad of tv shows and film about the national security state. The number of shows and films are astounding and are the subtle, soft power touch behind authoritarianism. Not watching them is a form of resistance. A propos, a WSJ column the other day by a female think-tanker attacking co-ed combat troops admitted there were career-equity arguments for letting the girls in: combat experience is a requirement for civil as well as military career advancement throughout the surveillance-industrial complex, including the FBI and CIA. So we need wars cuz we build resumes cuz . . . Russia! Syria!! And secret ribbons for Venezuela? Wasn’t it Frank Zappa who once said that ‘politics is just the entertainment division of the military-industrial complex’? Looks like he was right. Yes, it was. And yes, he was. The estimable Mr. Zappa also said that if and when necessary the facade will be dropped. re: Russia–Al Jazeera has just started running a series called Putin’s Russia. Very insightful, for me. Olga with: Unfortunately, since at least 1056, Russia has charted a separate path from the west and refused to be subdued. has helped as much. Interesting times, then. Beautiful Painting by Tadema hangs in Baltimore USA’s Walters Museum. And Mr Stether, I did; and you are something special.